White paper on crime 2004 Part1/Chapter2/Section2/5. In2003,2,150convicted foreign nationals were newly admitted,an increase of183(9.3%)from2002(Source:Annual Report of Statistics on Correction). Foreign national inmates who need treatment programs different from those for Japanese are categorized as Class F and treated according to culture and custom in their countries.In2003,1,584were newly admitted as Class F,and total Class F convicted prisoners were3,010as of the end of December2003(Source:Annual Report of Statistics on Correction). Foreign probationers and parolees newly received in2003were1,303,an increase of100from2002.Adult parolees(1,037persons)were the largest in number,followed by juvenile probationers(176persons),juvenile parolees(60persons),and adult probationers(30persons)(Source:Annual Report of Statistics on Rehabilitation). Fig. 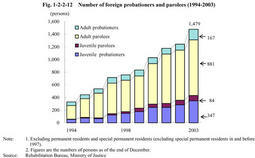 1-2-2-12 shows the number of foreign probationers and parolees(excluding permanent residents and special permanent residents;hereinafter the same in this subsection)as of the end of each year over the last10years.Foreign probationers/parolees have increased consistently to1,479in2003,up236persons(19.0%)from2002. As of the end of December2003,826(93.6%)of881adult foreign parolees had been classified as to be deported,among whom,two parolees were accorded provisional release,153persons detained,and671already deported(Source:Data by the Rehabilitation Bureau,Ministry of Justice). Table 1-2-2-13 shows the number of foreign probationers and parolees as of the end of December each year from2001to2003,by nationality and by type of probation/parole.Those from Asia had the largest share,followed by those from America,and both of them accounted for more than90%of the total.In2003,in their nationalities,China(including Taiwan)had the largest share(461persons),followed by Brazil(280persons),South/North Korea(209persons),and Iran(111persons).Those from Brazil accounted for a large number in juveniles,coming to199. Foreign nationals who need treatment programs different from those for Japanese inmates are categorized as Class F.More specifically,foreign nationals who need special consideration in terms of treatment due to lacking adequate ability to understand Japanese or make themselves understood in Japanese or having manners and customs different from those of Japanese people.